The well known in mobile GPS industry, Mio Technology has unveiled its new phone, named as Mio Amber. The handset has been design specifically to run on Windows Mobile 6.5. The phone has been enhanced with noise-cancellation technology for providing clear and quality sound. It powered by a 528MHz Qualcomm MSM, the phone is also equipped with a 5-megapixel camera with auto focus function. It boasts a 3.61-inch WVGA touch screen, has built-in 256MB RAM, integrated A-GPS navigation, supports GPRS/EDGE and WCDMA/HSPA network. 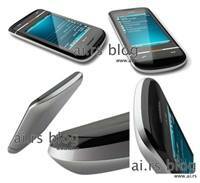 In addition, it is Bluetooth 2.0 enabled and supports microSD memory card. The availability and the priced are not yet announced.